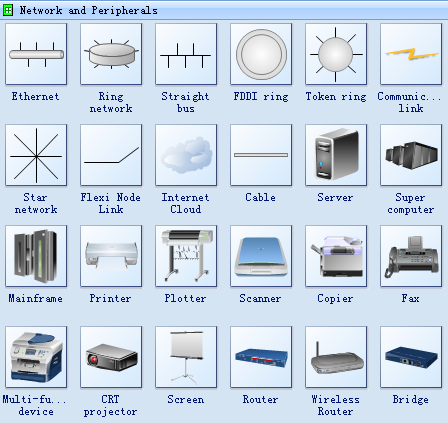 Edraw is a very useful program for creating graphic documentation of a computer network. It not only has the built-in tools needed to graphically display network information, but also is straightforward and easy to learn. You can show relationships between network devices with a simple, drag-and-drop method that quickly creates a sharp, crisp and professional drawing. You don't have to be an artist to create a network drawing. Edraw itself will take care of most of that for you by providing prefab drawing components. But you need to lay out the pieces carefully and thoughtfully so that the drawing is not only informative but looks professional as well. A polished appearance will lend credibility to your work. If your drawing looks unprofessional, why should anyone take the time to look at it? Let's look at some ways to ensure more professional-looking results. 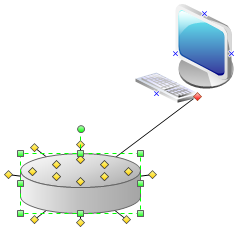 First, use the network diagram template that comes with Edraw. Click Library category then choose Network Diagram, and you'll see several stencils to choose from. 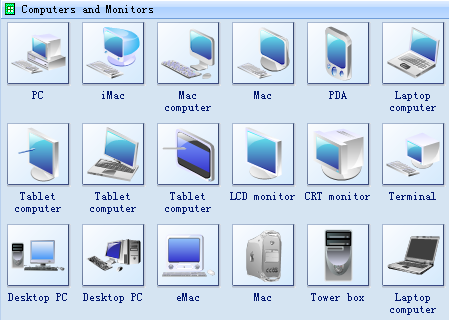 Probably the most useful ones are Basic Network Shapes, Computers and Monitors, and Network and Peripherals. Each of these templates offers a variety of networking components, which you can simply drag and drop into your diagrams. You can easily draw lines between network components to represent cables, for instance, using the dynamic connector. This handy tool will attach to a drawing from a template at an anchor point and will snap to grid, theoretically creating a straight line. Edraw includes more network symbols than Visio. All symbols are vector graphics and are drawn with Edraw. Every symbol can be formatted with the desired color, weight, fill, and so on. A drawing that only looks good isn't very useful unless the person who is looking at it can tell what he or she is looking at. You certainly need a title, which you can create with a standard Visio text box, but there is more to it than that. Each item or component within the drawing needs to be clearly labeled. It should have enough information to be useful but not so much that it's overloaded. How you label items exactly in your drawings depends, of course, on what information you're trying to communicate. Each network component found on a stencil comes prelabeled with a generic name such as Server or Router. You can change that to whatever you want simply by double-clicking on the component. This opens up the label for editing and formatting just as with any other text, as shown in the Figure. When you finish typing, click outside the text block to end editing. Move the yellow control point to change the text position related to the network symbol. If you find yourself running into the problem of too many labels, you can use formatting to communicate information. Every component you draw in Edraw, whether it is text, a line, or another type of object, can be formatted with the desired color, weight, fill and so on. Simply right-click on the object and choose Shape Format from the pop-up menu to access these options. In a network topology drawing, for instance, you probably want to represent different kinds of cabling in the network, such as 100-Mbps twisted pair and Gigabit Ethernet dual- mode fiber. Instead of labeling each line that represents a cable, which could quickly clutter your drawing, you can color-code them. Then, just include a legend that identifies what each color represents, as shown in Figure E. If a color printer isn't available, you might want to format the line styles differently to distinguish them, using a dotted line, a thin solid line, a thick solid line and so on. To create a smart connector you need to point the cursor at any connection point of the shape. The connection point will be highlighted red.